All Saint’s Day seemed like an appropriate day to pay a visit to the Père Lachaise Cemetery. The Père Lachaise Cemetery is the largest cemetery in Paris and the final resting place of some of it’s most famous citizens including Oscar Wilde, Gertrude Stein, Molière, Jim Morrison, Frédéric Chopin, and Héloïse and Peter Abélard. Napoleon opened the Père Lachaise Cemetery in 1804 after the last city cemetery was closed in 1786 when they were deemed likely to spread disease. At that time all the bodies in the city were transferred to the Paris Catacombs, just to the South of the City. When Père Lachaise opened, it was located on the outskirts of the city and the residents deemed it too far away to be useful. To better market the cemetery, it’s administrators had the bodies of luminaries such as the playwright Molière and poet Jean de La Fontaine transferred to the cemetery. 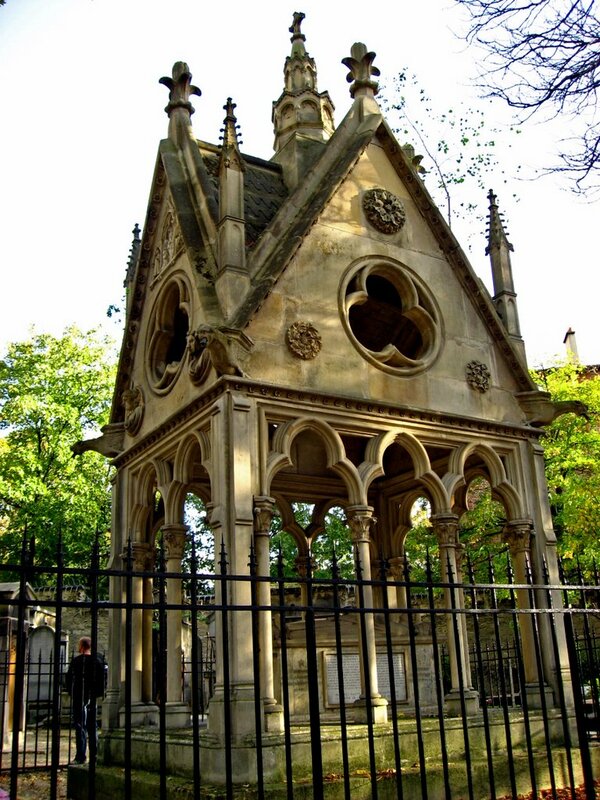 Then, in 1817, the remains of Héloïse and Peter Abélard, the famous star-crossed lovers were transferred to Père Lachaise from the crumbling Abbey of Nogent-sur-Seine. From that point on Père Lachaise became the place to buried in Paris. Only a few years later 33,000 Parisians were buried there. 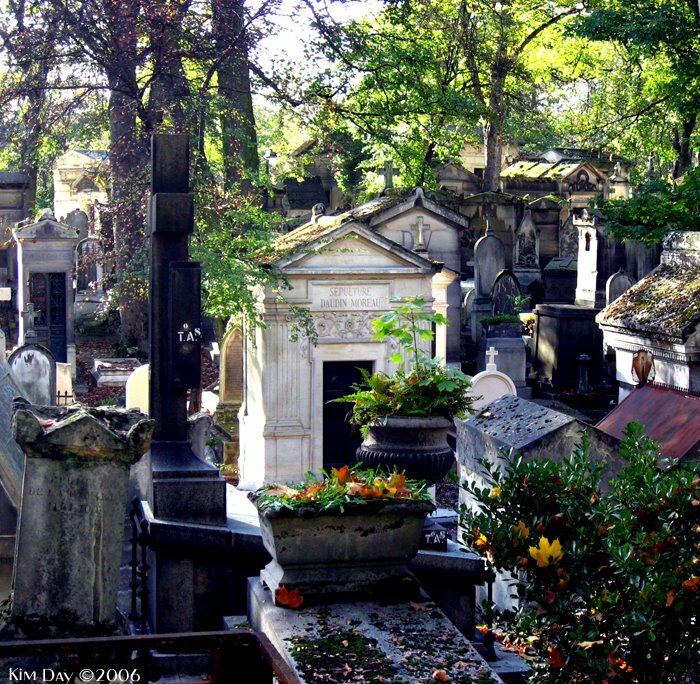 Today, more than 300,000 have made Père Lachaise their final resting place. The cemetery is so large, it resembles a small city with cobble stone roads and dirty paths. The markers range from simple headstones to elaborate crypts and statues. 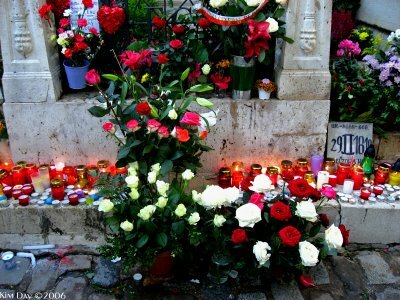 Graves like Jim Morrison and Frédéric Chopin still draw throngs paying homage with candles and flowers. 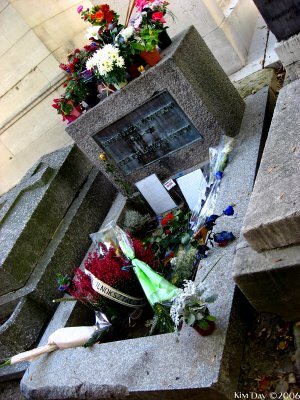 Jim Morrison’s was at first denied admittance to Père Lachaise by it’s administrators. Only after his friends told the administrator that he was a writer was a spot found for the American rock star. 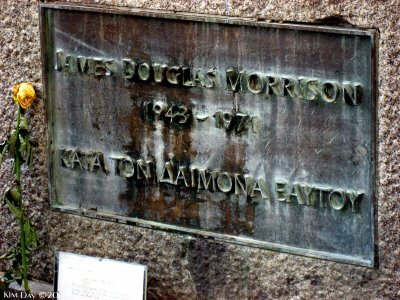 Morrison’s first elaborate headstone was stolen by devoted (crazed?) fans. It was replaced by a more subdued version that has remained in place. Frédéric Chopin, dead for more than 150 years, still draws crowds even larger than those at Morrison’s grave (one of the most popular). On this sunny fall afternoon, I had to fight for space in front of his grave the path was so crowded. The base of his resting place is covered with dozens of flower bouquets and burning candles. Héloïse and Peter Abélard are one of history’s most famous pair of star-crossed lovers. Peter Abélard, a scholar who frequently critiqued Catholic Church doctrine, was the founder of the University of Paris (near the Sorbonne). Abélard was hired to tutor Héloïse, the niece of the very power Canon of Notre Dame. Their intense intellectual connection became a passionate one and the two were secretly married. Following the birth of their son, news of their marriage finally reached the Canon who in a fit of fury had Abélard castrated. Abélard and Héloïse retreated to a monastery and convent respectively, and never lived together again. For the next twenty years they traded passionate love letters. Héloïse eventually became an abbess and Peter a fierce church critique (so fierce he was on trial for heresy at the time of his death). Following their deaths they were laid to rest together in Héloïse abby where they remained until their transfer to Père Lachaise cemetery. After I finished communing with the dead, I took the Metro to Place de Bastille intending to wander through the Marais district. However, I got distracted at the top of the escalator by an outdoor show of Paris Contemporary Art. I wandered through tent after tent lining the Canal St. Martin of some of the Paris’ best artist of today. I saw amazing paintings and sculpture and glass work. I was seriously tempted to buy a couple of pieces, but the price tags gave me pause. The cheapest painting was around 220 euros. Well, I have a few more days to decide whether or not I really want one of them. The art show runs through 5 November. My wallet isn’t safe just yet. I capped off my day with dinner at a little Bistro around the corner from my hotel that I’d been walking by for the last week. The inside was tiny and held 10 tables max. The menu was limited and was available by chalkboards only. I had a filet mignon with potatoes and apple that just melted in my mouth. I capped the meal off with a Tarte de Tatin (an apple pie without the top crust, topped with crème fraiche–whipped cream). I passed my meal chatting with two American couples who were traveling separately; we had the place to ourselves and pretty much took it over. One pair was from California and the other from Colorado. The older couple from California were world travelers and adventurers. They had just come from several weeks in Egypt and regaled me with stories from places like Timbuktu and only whetted my taste for more exotic travels. They had just spent several nights in Siwa Oasis, an eco-resort near the Libyan boarder. The couple from Colorado had spent the last few weeks traveling by car through France. We compared notes about our favorite Loire Valley castles. The wife lamented how much Paris had changed since her first trip during the late 1960s. She had been here during the Vietnam war and said she missed the intellectual activism of the left bank during that time period. We discovered that we had many connections from Missouri to Vermont. His father lived in the Kansas City region (I grew up in Jefferson City, Mo and have spent much time in the Kansas City area over the years) and she had grown up in Burlington, Vermont (my home for nearly 4 years). When you’ve spent some time in a foreign country essentially by yourself where your native language isn’t spoken, you suddenly become very eager to find people who speak English and come from a common background. The second you hear English, your head swivels and before you know it you’re introducing yourself to perfect strangers. Both couples were as eager as I to trade stories. Sometimes there’s nothing like a little piece of home, even if it’s just for an hour, no matter how much fun you’re having. This entry was posted on Wednesday, November 1st, 2006 at 6:20 PM. 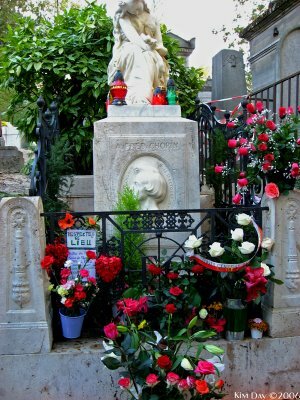 It is filed under France, Paris, Travel and tagged with Frederic Chopin, Héloïse and Peter Abélard, Jim Morrison, Père Lachaise Cemetary. You can follow any responses to this entry through the RSS 2.0 feed.